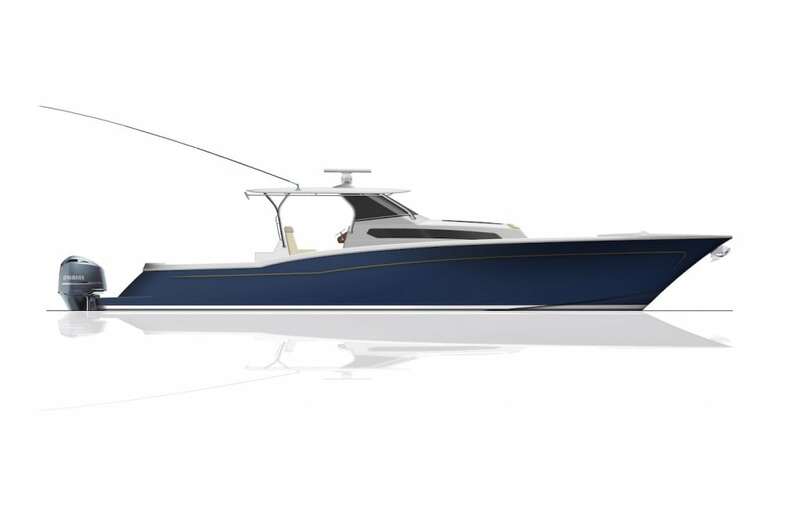 The Sea Force IX 41.5 Sport CC (LOA: 41′ 5″, Beam: 12′) is the first in a new line of 41.5- to 56.5-foot boats from the Palmetto, Florida-based builder. The launch date for hull No. 1 is mid-summer 2017. When equipped with 1,200 maximum horsepower, the boat is expected to run at a top speed of approximately 60 mph and cruise at 40 mph, with an estimated 400-plus-mile range using the 500-gallon fuel tank. The Sea Force IX 41.5 Sport CC also carries 60 gallons of fresh water, has a 15-gallon holding tank and carries 30 gallons of diesel for the optional generator. The boat is loaded with standard features like dual-transom side-entry boarding doors, electric head, AGM batteries, LED lighting throughout, microwave, AC/DC refrigerator, air conditioning in the console cabin as well as plumbed to the helm, three-wide helm seating with flip-up bolsters and armrests, and full powder-coated aluminum pipework. All construction will be 100 percent composite utilizing high-quality vinylester resins, epoxy, high-density PVC core, and the most advanced multi-directional knitted fiberglass available.